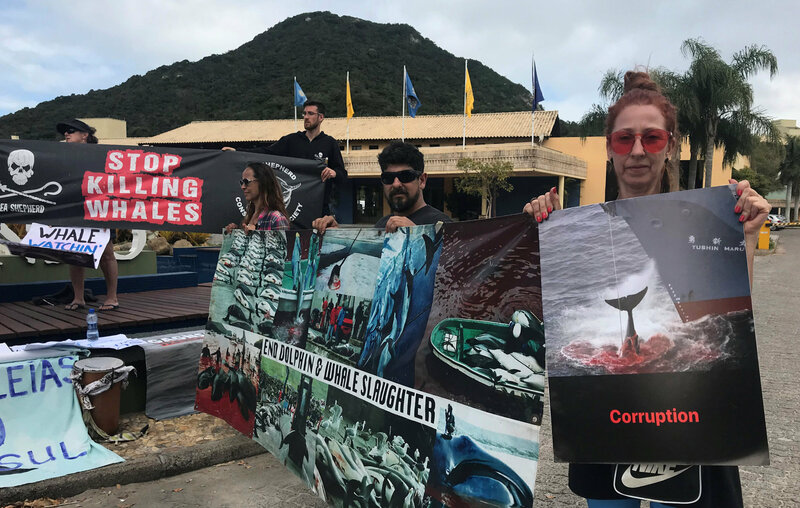 SANTA CATARINA, BRAZIL - Pro- and anti-whaling nations locked horns Monday as the International Whaling Commission (IWC) began meeting in Brazil amid outrage over Japan’s proposal to end a three-decade old moratorium on commercial whale hunting. “Our challenge at this meeting is whether we can bridge the two different ideas or find a situation where we can agree to disagree so that we can see the future rather than just fighting each other,” said Morishita. 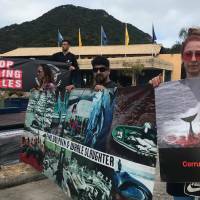 But the sides appeared as far apart as ever on the emotive issue of whale hunting as the weeklong meeting got underway in the surfers’ paradise of Florianopolis. As whales breached and spouted huge plumes of misty air in Florianopolis bay, clearly visible from delegates’ hotels, Japan and host country Brazil are proposing two diametrically opposed visions of how to manage them. Japan is presenting a “Way Forward” document, which would create a “Sustainable Whaling Committee” for nations wishing to allow their nationals to hunt healthy whale populations for commercial purposes. Anti-whaling members like the European Union, Australia and New Zealand are determined to block them. Brazil is trying to rally anti-whaling nations behind a “Florianopolis Declaration,” which insists commercial whaling is no longer a necessary economic activity and would allow the recovery of all whale populations to pre-industrial whaling levels. Brazil would also expand the whale protection zone from the current Austral and Indian Oceans Sanctuaries to the entire South Atlantic. “Japan’s ‘way forward’ proposal is procedurally unsound and would take the International Whaling Commission back to the days when it presided over unsustainable whaling operations,” said Leigh Henry, the World Wildlife Fund’s (WWF) head of wildlife policy in the U.S.
Other key issues being discussed in the weeklong meeting are risks to whales of human-made underwater noise pollution, ship strikes, climate change and “ghost-gear” entanglement — where whales are increasingly snared by abandoned fishing gear. Nations opposed to whaling plan to renew a long-standing proposal for the creation of a South Atlantic Whale Sanctuary, after previous proposals were thwarted by the pro-whaling lobby. The moratorium — agreed in 1986 amid fears that some species were becoming extinct — is still in place, with some exceptions. Japan formally observes the moratorium but exploits a “scientific research” loophole to kill hundreds of the animals every year, despite international criticism. It has regularly sought an easing of the IWC’s prohibition on commercial whaling, and is pushing hard for a rule change that would allow decisions to be made by a simple majority vote instead of the current three-quarters majority. “The reform proposals are aimed at making the IWC capable again of making decisions as a resources-managing body, and we believe it would be in the interests of all members including anti-whaling nations,” Japanese government spokesman Yoshihide Suga told reporters in Tokyo. “Our country hopes that the reforms will be supported, that the IWC will be functional again as a resources-management organization and that commercial whaling will be resumed. We will make utmost efforts,” the chief Cabinet secretary said. In another category of exemption, aboriginal subsistence hunting is allowed in several countries, including the United States, Russia, Greenland and Saint Vincent and the Grenadines. Conservation groups are opposed to a proposal before the IWC to increase annual whale kill quotas for these countries, and automatic renewal of quotas every six years, without consulting the IWC’s scientific committee. “WWF recognizes the need for aboriginal subsistence whaling where it is carried out for local consumption, but countries should not bypass the Commission, weakening the IWC and the impact it can help create,” said Aimee Leslie, WWF Global Cetacean expert.